I loved the projects that came in the March Paper Box AND the additional stamp set too. What a great value and all the cutting and work was done for me all I had to do was assemble. Of course after that what do you do with all those goodies that are left over? Make something with them of course. So today’s project uses the stamp set from the kit. 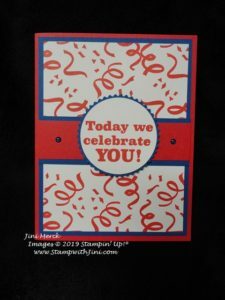 The kit came with the Poppy Parade ink spot so I started there – I added a couple of our great punch shapes and some Poppy Parade and Blueberry Bushel card stock. And of course, a PDF so you can make one too. Like the idea of projects arriving on your doorstep? Getting exclusive stamps? These are awesome for crafting on the go or as gifts since everything is included. You can click HERE to subscribe or click HERE and purchase a prepaid subscription that can be added to any order. This entry was posted in Cards, Techniques & Tutorials, Videos and tagged Birthday, Paper Pumpkin Kit, Poppin' Birthday, Tutorial by Stamp with Jini. Bookmark the permalink.